extra info:Devimon was the first villain that the Digi-Destined faced. extra info:Myotismon is a Digimon of the vampire nature. He has large forces who help him to try to take over the real world. extra info:Ogremon is the symbolic representation of bad Digimon. His chief rival in life, Leomon is the symbolic representation of good Digimon. extra info:MetalEtemon returned to the Digital World riding a comet that crashed into the ground. 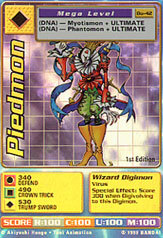 extra info:Piedmon is the leader of the Dark Masters and commands the other Dark Masters of MetalSeadramon, Puppetmon, and MachineDramon. extra info:DemiDevimon is Myotismon's lackey. He is a trickster and a liar.